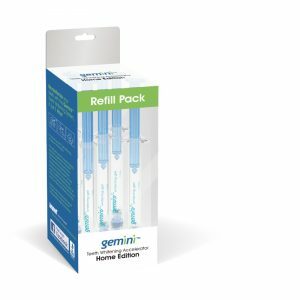 Gemini® Teeth Whitening Accelerator Home Edition – Beyond International Inc. 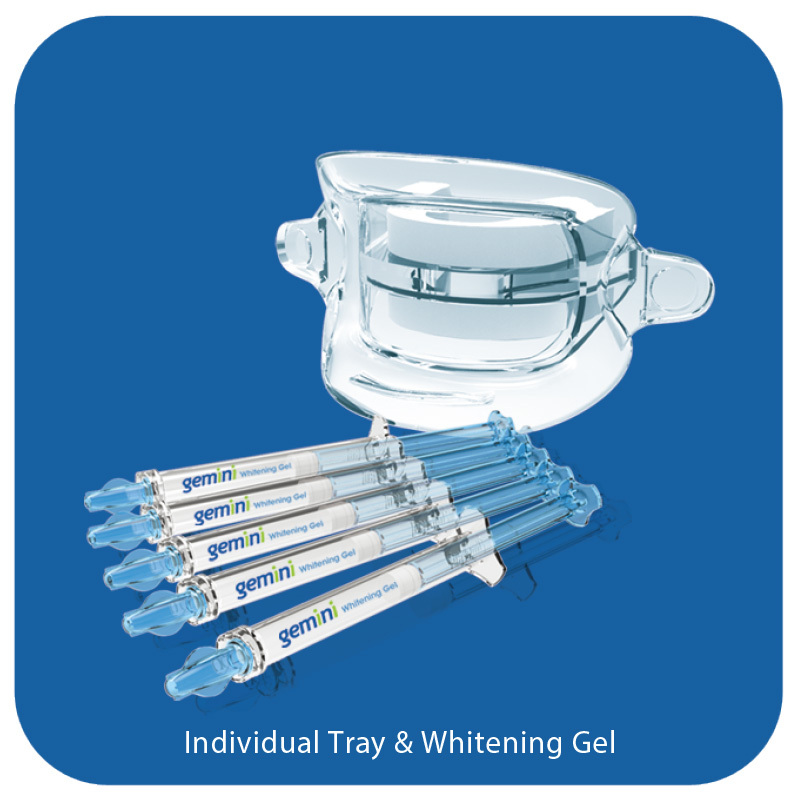 The Gemini home whitening system guarantees fresh, safe and brilliant results in just one hour. 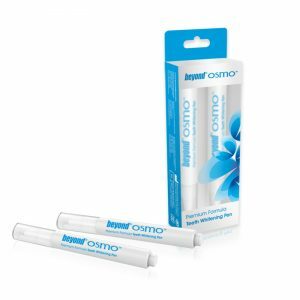 The gentle 6% hydrogen peroxide (H2O2) formula is a perfect at home teeth bleaching solution. With over 20 years of experience, BEYOND has generated an advanced system that is designed for you and defined for your smile in the comfort of your home. 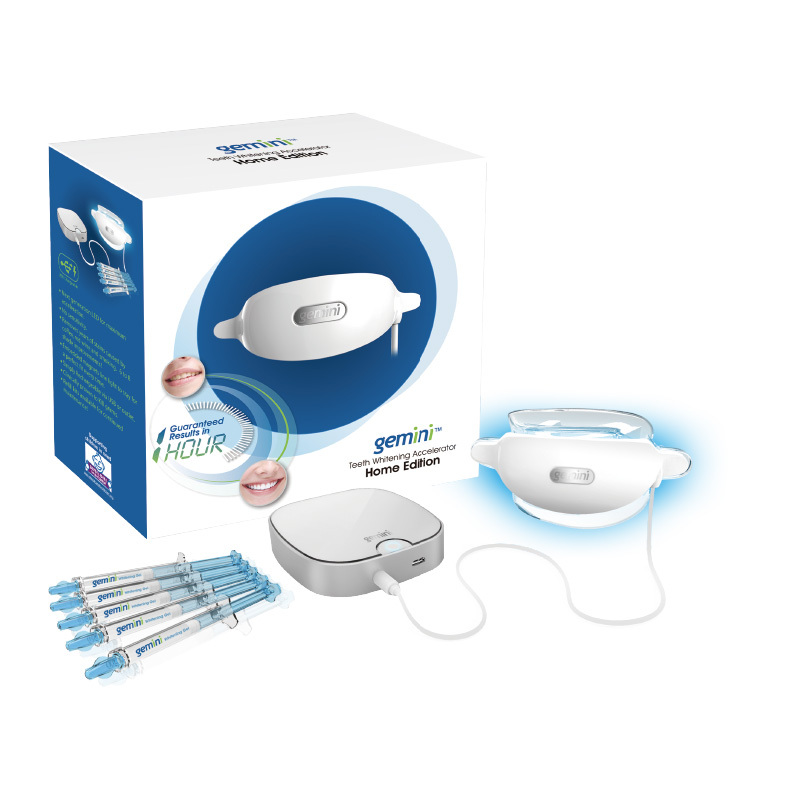 Gemini Teeth Whitening Accelerator includes whitening gel for five – twenty minute sessions, Gemini LED light unit, Gemini tray, rechargeable lithium battery, charge cord and USB adaptor and bleaching shade guide. 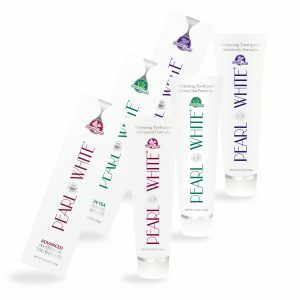 The Gemini Accelerator has several unique advantages for at home whitening. First, it’s easier and more comfortable to get a proper mouthpiece fit with the light activator because small magnets are set into the mouthpiece to ensure proper alignment. This also allows for a hands-free and relaxing treatment. Additionally, the light activator is rechargeable, especially since gel refills and additional trays are available for continued use. The gel is a gentle 6% hydrogen peroxide formula that ensures maximum results on surface stains, but is also effective on more severe stains caused by tetracycline and fluoride. Determine original tooth shade using the Bleaching Shade Guide. Mark shades for post-treatment comparison. Using one of the included gel syringes, apply the whitening gel evenly along the margin of the tray between the OUTSIDE of the sponge and the inner plastic lining, according to illustration. Insert tray inside mouth. Horizontal tab should be facing from the bottom of the tray, for light unit to rest against. Bite gently between the sponge and front of tray. Teeth should fit over teeth outline on tray. Adjust the lips up and away from the tray and rest the lips in the lip guard portion of the tray for a comfortable fit. Place the Gemini light emitter in front of tray. Embedded magnets will automatically direct the light to the optimal position in front of the tray. Press and hold “teeth whitening, home kit, bleaching” button for five seconds. Gemini light will activate for a full twenty minute cycle. At end of session, light will automatically deactivate. If session needs to end prematurely, press and hold “teeth whitening, home kit, bleaching” button for two seconds. Light will deactivate. After twenty minute cycle, remove tray and brush teeth with non-colored toothpaste. Tray can washed with soapy water and rinsed and then air dried or patted dry with tissue or soft cloth. Evaluate color change against the marked shades from step 1. Q: What results should I expect from the Gemini® Teeth Whitening Accelerator? A: Results will vary depending on tooth condition, but one should see on average a 6-8 shade improvement after one sitting of sixty minutes in total. Q: Can I expect tooth sensitivity? A: No. Tooth sensitivity can occur from either high concentrations of hydrogen peroxide or dehydration from the gel or light. 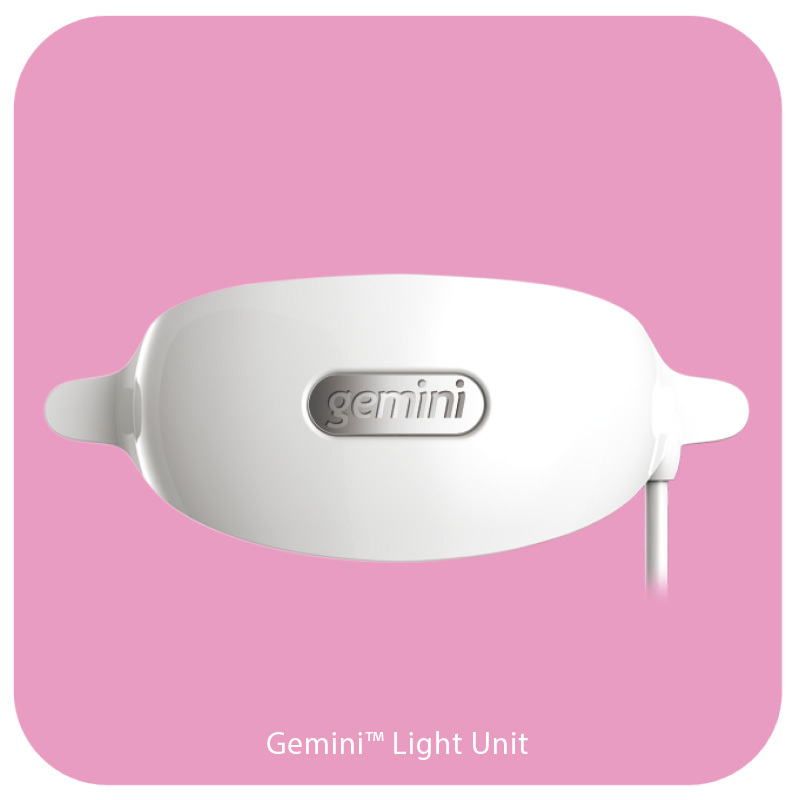 The Gemini® uses a mild 6% concentration, coupled with a UV-free LED light accelerator. Q: Who can use the Gemini® Teeth Whitening Accelerator? 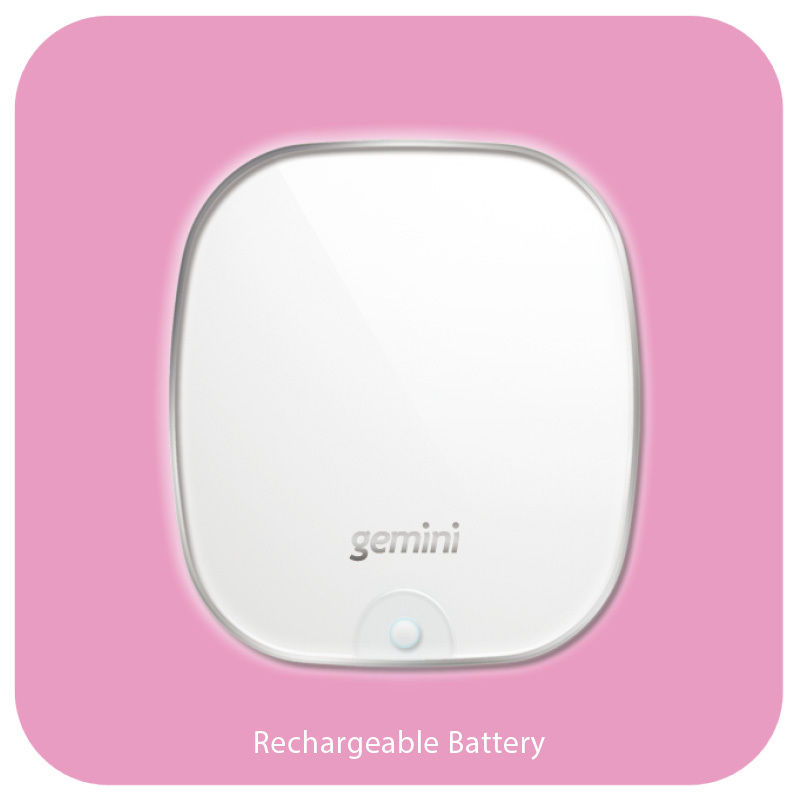 A: The Gemini™ is user-friendly enough for anyone to use, but is generally suggested for those 18 or over. We also do not suggest either pregnant or nursing women to use. Q: Do I have to do all 3-20 minute procedures in a row? A: No. This is recommended for best results, but the procedure can be broken down to a single 20 minute session per day. We do recommend the full three sessions of twenty minutes in one sitting for the fastest and longest-lasting results. Q: Do results vary per person? A: Yes, the results will depend on your teeth condition and personal habits. Generally speaking, the Gemini® will bring your teeth shade back to where it was originally before you stained it from tobacco use, coffee, or red wine. Q: How long should I wait between procedures? A: After a full teeth whitening, we generally suggest you wait 3-6 months before another session. It will generally take this long to re-stain your teeth from normal life habits. Q: What type of gel is being used? A: We use a 6% hydrogen peroxide mix, which allows for a mild formula and yet provides strong results when combined with our specially designed Gemini® accelerator. Q: How long does the gel last? A: The gel should last through the expiry date (around 18 months), but be sure to refrigerate the gel once it’s opened. Q: Will the Gemini® work on porcelain veneers, bonded teeth and dental implants? A: Veneers, bonding and dental implants all will collect surface stains over time. 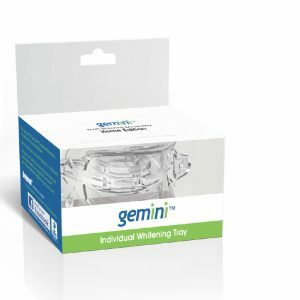 The Gemini® treatment will whiten these stains, but the whitening will not be as deep as with live, natural teeth. The whitening will not go past the initial color that was created for the material. Q: If I experience sensitivity, what are the next steps? A: You should get in contact with your local dental professional to ensure your teeth and gums are healthy. It is unusual to have sensitivity with the Gemini® treatment, and this could mean you have a separate dental concern. Q: Can I use other gels with the Gemini® system? A: The Gemini® gels were specifically formulated to safely react with the Gemini® accelerator. Extensive testing was used to provide premium whitening results without sensitivity. We cannot offer an opinion on other gels regarding safety or effectiveness. Q: I followed the steps, and would like for my sister to try also. Can I buy trays separately? A: Yes, we offer both the tray and refill gels separately. 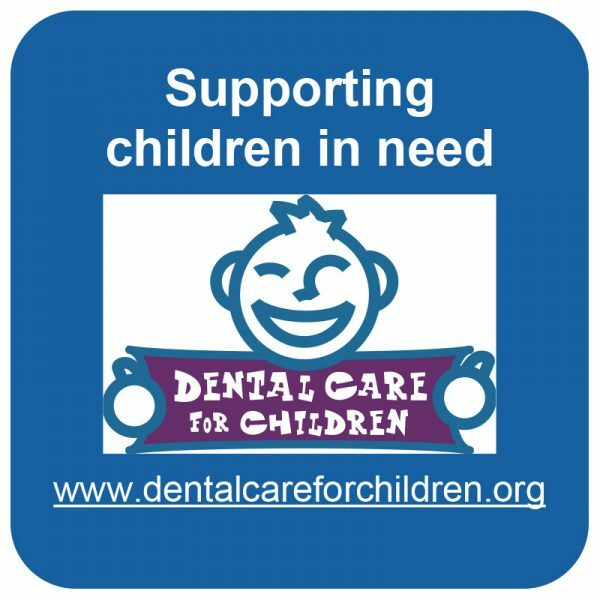 You can contact us via our website at www.beyonddent.com to reorder. Q: Is the Gemini® FDA approved? A: The Gemini® is listed as a Class I medical device with the FDA.